What is a tethered barcode scanner? Barcode readers (or scanners)have been around for many years. They started as dedicated devices plugged into special ports, usually for dedicated computers, such as those used for point of sale. Then they became available as "wedge readers", so named because they were connected between the keyboard and the computer (system unit). Most readers now use the USB interface to connect the to the computer. This is a basic unit, the first choice for most applications requiring a barcode reader. It is a solid device, reliable and effective. It plugs into the computer using a cable and USB connector, and takes its power from that source. It uses laser technology, with scanning the target barcode a hundred times a second. So if it doesn't get a good read on the first scan, it will most likely get it on the second scan, and you won't notice the delay. It can read all the standard symbologies, and can be configured as a presentation scanner (always on, so you offer the work to the scanner, not the scanner to the work). A nice solid unit, well made, good finish. Fits comfortably in the hand. Cords and fittings are good. The unit is very easy to set up. Plug it into your computer. Call up Notepad. Begin scanning. There are a variety of available setup options including the ability to add a preamble or postamble (strings of text inserted before or after the information contained in the bar code). For use as a presentation scanner the unit can be set to be "always on". The various configuration options are set up by scanning special barcodes in the handbook provided with the unit. the unit works well with barcodes in the range three to 9 inches, dependent upon the size of bar code. a low cost and capable unit. the cable can be an inconvenience. Consider a cordless alternative. 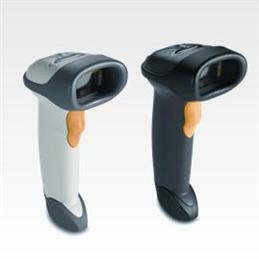 This unit is for 1-D barcodes only, consider an alternative product if there is a requirement to read 2-D barcodes. this is a very good base unit for simple applications. Rugged, reliable, capable, inexpensive. Recommended. If you would like current pricing and availability on the Symbol LS2208, click this link, let us know your name and email address, and we will get back to you with a quote.